On the back of today's United States-North Korea summit and fears over global trade after the Group of Seven meeting over the weekend, the Straits Times Index posted modest gains of 5.32 points to finish at 3,441.69. It followed last Friday's gains in Wall Street. If the summit ends with encouraging signs of denuclearisation on the Korean peninsula, it would remove a huge overhang of a key geopolitical threat and bring cheer to financial markets, said analysts. "Improved risk appetite would be seen as encouragement for global stocks. Uncertainty over the past year around (Donald) Trump-Kim Jong Un relations was seen as one of the major risks for the financial markets," said Mr Jameel Ahmad, FXTM's global head of currency strategy and market research. Elsewhere, other major Asian markets were mixed with key indices in Japan, Hong Kong and South Korea posting gains, while Australia, China and Malaysia closed in the red. Mid-to end-week also has its fair share of risk events, chiefly the respective monetary policy meetings of three central banks that have provided the most liquidity in the world - the US' Federal Open Market Committee, European Central Bank (ECB) and Bank of Japan. A rate hike out of the US is widely expected, while ING's research head and chief economist for Asia-Pacific Rob Carnell said the outcome of the ECB meeting is less clear. Singapore drew a favourable report from Credit Suisse yesterday with the market being described as the "place to be" for equity investors as it offers a "blend of cyclical exposure, is a beneficiary of higher interest rates and trades at an attractive valuation". The key index's 5 per cent pullback over the last month has also provided an attractive entry opportunity, said Credit Suisse investment strategist Suresh Tantia. 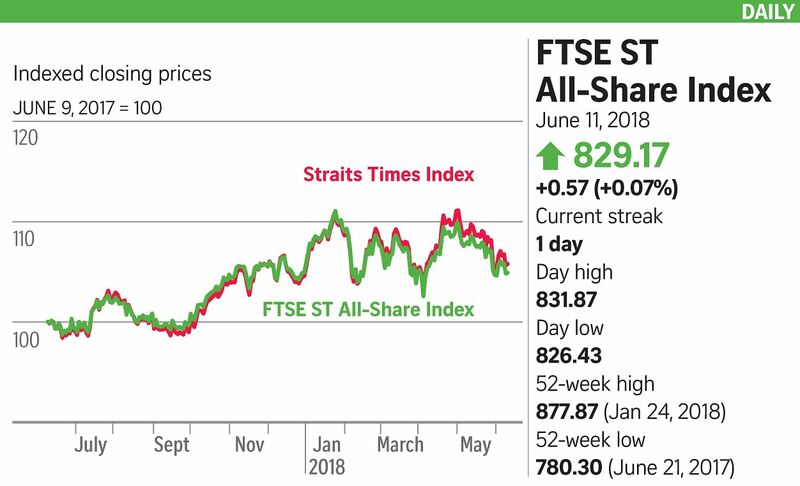 "Singapore is the only South-east Asian market which has witnessed positive earnings revisions over the past three months, and is likely to deliver 15 per cent earnings growth in 2018. As the year progresses and earnings are delivered, we believe the Singapore market will grind higher. We expect the FSSTI to rally to 3,850 over the next 12 months," he added. Turnover came in at 1.77 billion shares worth $968 million, versus last Friday's 2.02 billion shares worth $1.13 billion. Losers outnumbered gainers 224 to 156. Gains were led by DBS Group Holdings, which advanced 15 cents to $28.65.